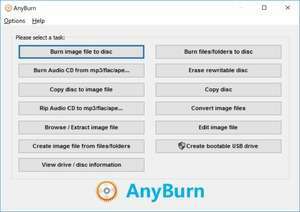 Free Any Burn is a light weight but professional CD / DVD / Blu-ray burning software that everyone must have. It provides a free and complete solution for burning. You needn't pay for this Free Any Burn software! For security reasons, you should also check out the Free Any Burn download at LO4D.com which includes virus and malware tests. Additional screenshots of this application download may be available, too.